In the days after terrorists' bombs ended Boston Marathon 2013, a tremendous surge of interest in participating in Boston Marathon 2014. 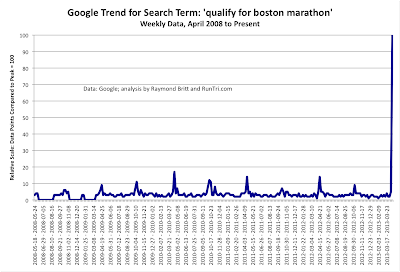 Our analysis shows 'Qualify for Boston Marathon' is one of the hottest searches on google, and compared to search trends at the same time of year since 2008, the interest is nothing short of extraordinary. But more importantly, the leap in interest seems to suggest more of a fighting spirit. Runners are thinking: dammit, I'm going to run Boston to prove we aren't afraid of evil, we're going to face it head on, to show once and for all that no one's going to mess with us again. Runners see it as a sort of patriotic duty, to unite in a tribute to honor those who suffered in the tragedy and to take back the legendary event. For more, see our Qualifying for Boston post or our Complete Boston Marathon Coverage.